Sometimes you fail, but then you try again. Today is the timed release of "The Plateau, Forever Ago", which will be available for only 48 hours. If you missed the previous newsletter there's a lot of information below on the process of creating the Plateau and the work that goes into creating each print. If you already read the last newsletter all you need to know is that there is also are 5 new stickers in the shop, a beautiful custom made bamboo display box and a little something hidden in plain sight - a nod for this timely release on April Fools. The timed Edition will be available for 48 hours from Monday, April 1st at 3PM PST until Wednesday. April 3rd at 3PM PST in the shop. I began the Plateau in late August while I was going through some familiar back pain. 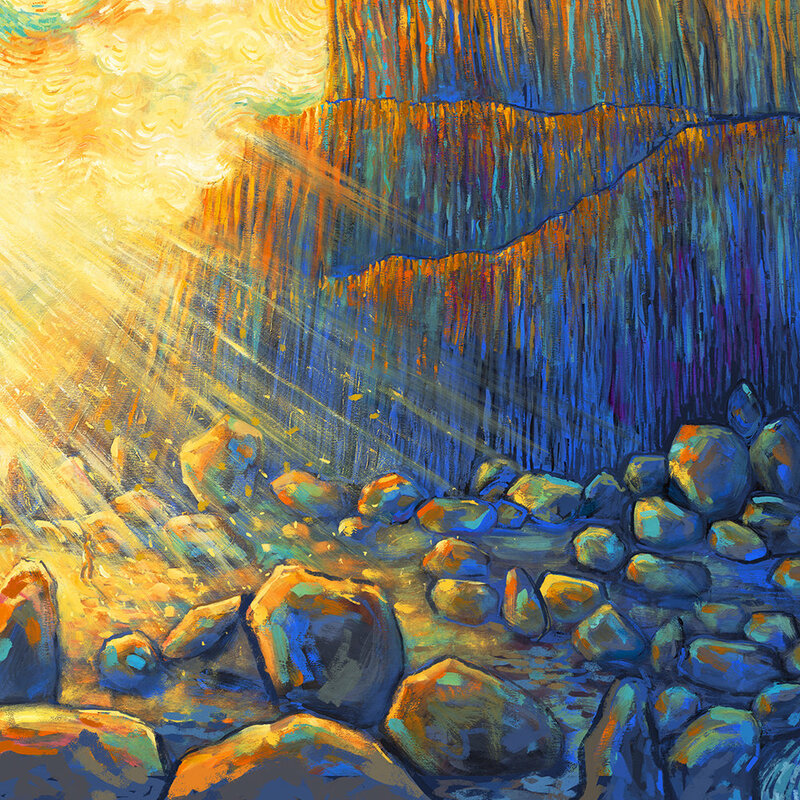 I worked on The Plateau intermittently between other pieces and other pain and finished it in late November. The Plateau is about a lot of things for me; it's about feeling like you've running in circles, it's about overcoming obstacles and perseverance in the face of failure, it's about perception and what is hidden right in front of you, but most importantly, it's about taking a step back and realizing all of your achievements that have gotten you this far. The Plateau is an illusion, an imp of the perverse, something constructed from the mind that can eat away at the heart; it has already become a seminal piece for the work that has followed it and I will probably always look back on The Plateau, but with a fondness and an understanding of where it lives in my mind. It's fitting that we spent another several months on perfecting the print of the Plateau. With our first attempt, Andres hand separated over 15 layers of a screenprint, but after we got there we realized the soft magic of the Plateau was gone and the print didn't resemble the same Plateau anymore. So we started over. We took the bones of what we were doing and reworked it into a print that brought new life to the Plateau while retaining the softness of the original gouache piece. 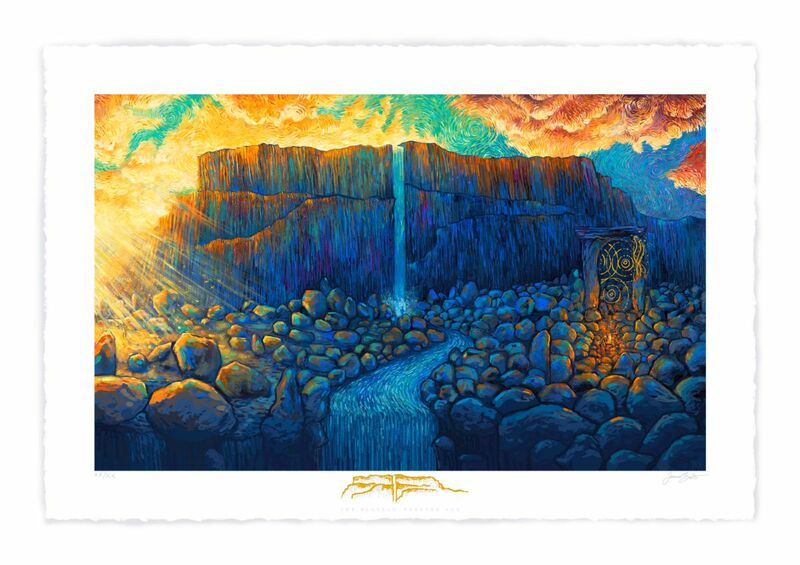 “The Plateau Forever Ago” is a high quality giclee print with three layers of screenprinting and gold leafing on 20" x 30" archival paper. 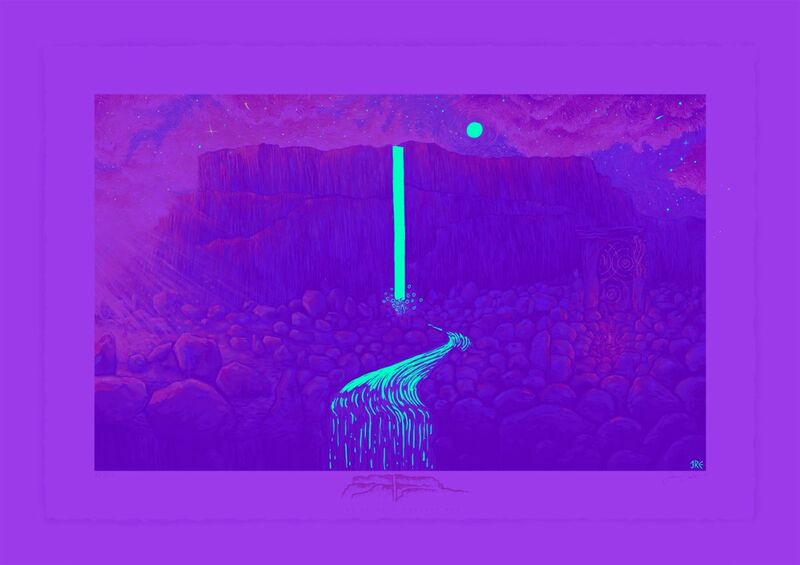 It comes with a custom marbled poem/Certificate of Authenticity and a blacklight flashlight. Prints are hand signed and numbered in limited edition and will be available for $175 + shipping. 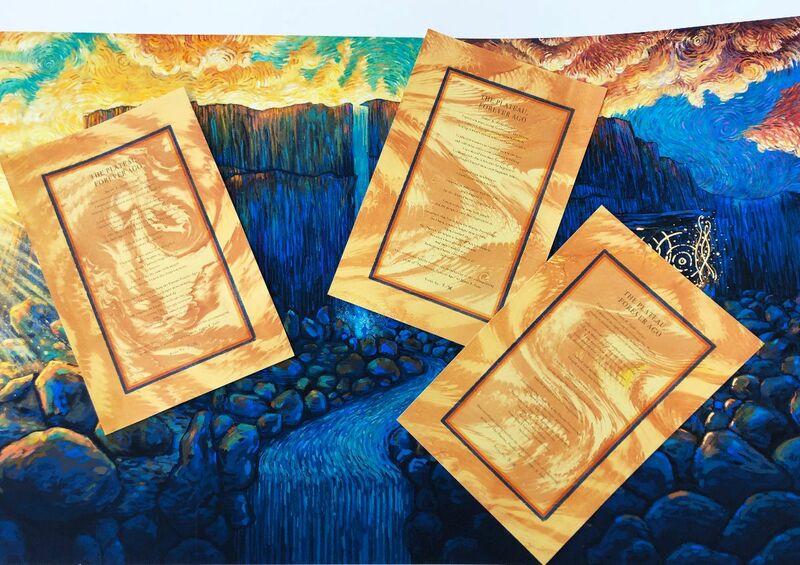 On the process: The Plateau was originally created in late 2018 on a 60" x 30" panel with gouache and was inspired by the poem below. The piece was then professionally photographed and scaled to print size. The edition is then printed in our studio on a high quality printer and finished with three screenprinted layers. The first layer is done with a gold metallic shimmer that accents the rays of light and the clouds above the Plateau. The second layer is an invisible aqua ink that can absorb the sunlight and glow in the dark to reveal a moon in a starry sky. These accents can also be seen under UV/Blacklight (small blacklight flashlight included with each print) without exposure to the sun. The final layer is done by hand applying triple 24K gold leaf on both the left and right side of the print. During the screenprinting process a 6" emblem in the bottom border is created from the three layers. Prints are then hand deckled and signed and numbered.